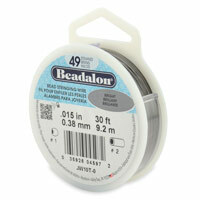 1) Take the 10 " length of beading wire and thread on one crimp bead, and one end bar. 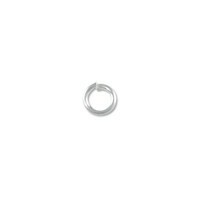 Take the wire around and back through the crimp bead. Pull the wire tail until the crimp bead cinches up to the loop on the end bar (leave about a 5mm loop). Crimp the tube and then cut off the excess wire with your side cutters.Close a crimp cover over the crimped tube. Repeat this step two more times with the two other lengths of beading wire. 2) Start and end each of these strands completely before moving onto the next one. 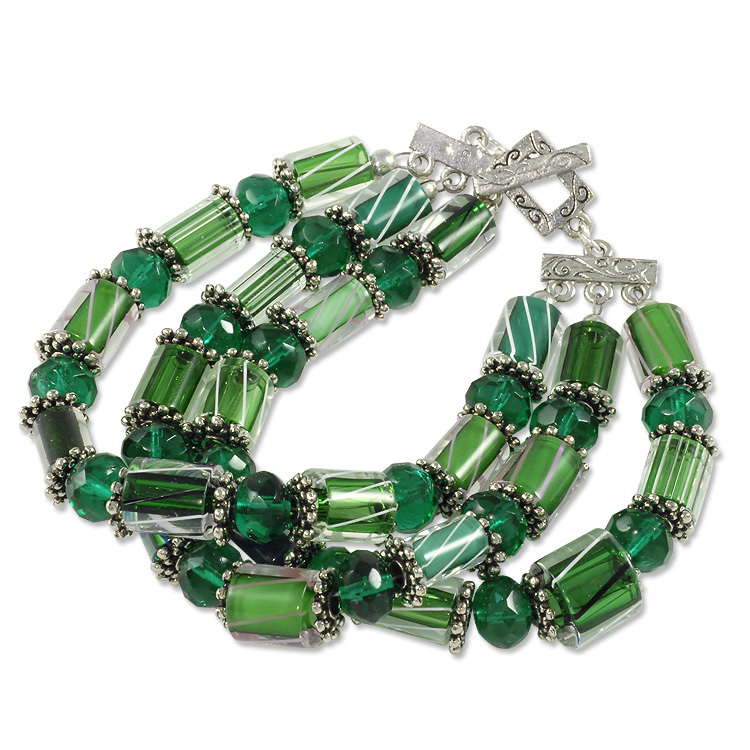 The pattern is to start with a cane glass tube, a pewter spacer, a emerald czech glass donut, and another pewter spacer. Repeat this pattern until you reach the length desired (make sure to end the pattern on a cane glass bead). 3) Thread on another crimp tube, and take the wire through the other end bar (make sure the pattern is facing the same way as the other end, and connect through the loop on the other end bar to mirror the first end). Take the wire around and back through the crimp tube. Be careful not to let the crimp tube slide back into the cane glass bead, and leave a bit of slack (maybe 3mm) from the end of the beading to the crimp tube. Also remember to leave a 5mm loop connecting the crimp tube to the connector loop. This step seems a bit unnatural because we're always taught to pull the wire tight and remove all slack. Well, because we're using larger beads, more wire will be required to make the bend in the bracelet to wear it properly. Test out your crimp tube placement before closing the crimp tube by wrapping the bracelet around your wrist. Too tight? Give a little more slack. Too loose, well tighten in up just a bit. Close the crimp tube with your pliers, and then close a crimp cover around the closed crimp tube. Cut off the excess wire. 4) Repeat steps two and three to create the other two strands of beading on the bracelet. Open all of the jump rings, and use two to attach the square end of the toggle clasp to one end of the bracelet. Use the other three to connect the bar end of the toggle clasp to the other end of the bracelet. Done! This is a great bracelet, and inspirational for future projects.